Staging 101 back drops install easily onto our standard Staging 101 guard rail panels. 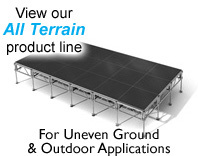 Back drops are sold in modular sections allowing design flexibility to fit nearly any size stage. One back drop section consists of a metal T-bar assembly that installs on top of an existing guard rail. Once installed, the T-bar telescopes out and is adjustable in height from 5’ to 12’ (or 1M to 3M) high depending on your needs high depending on your needs. The T-bar's telescope design also allows it to be disassembled and folded down compactly into a 4' high length for easy transportation and storage. 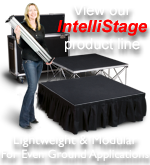 Back drop panels are designed to be used with Staging 101 stage curtains. 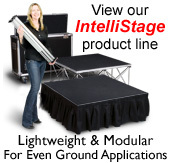 Stage curtains are available in modular panels and are made of a black fire retardant material. Stage back drops also allow for easy installation of customer's own custom made curtains, custom banners or projection screens. Storage/transportation bags for back drops and curtains are also available. Our modular backdrop frame attaches to Guard Rails for hanging curtains and backdrops or par can lights. Our backdrop frames feature easy installation, compact storage as well as pre-drilled top bar holes for quick backdrop attachment and marked height indicators for easy height adjustment. No matter what your needs are IntelliStage has you covered. Black Back Drop Curtain for IntelliStage back drop frames. Availablein 4' and 1M panels. Guard rail panels with integrated chair stop and mounting hardware (2PK). Available in 4', 3' and 1M sizes.